Wild, elegant iris flanking the roads. Beholding them in their natural environment is a gift! 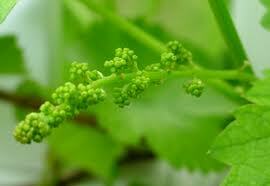 Sangiovese grapes just starting to pop from the vines....new life is so invigorating to see! What does this year's harvest have in store? We were only 2k into our ride when we were greeted by a small flock of sheep! Pecorino in the making! After which we saw Massimo picking the most luscious bing cherries from his enormous front yard tree in Chiesanuova! As we gazed in awe from the road, he invited us in through the front gate, climbed up the ladder and brought us a basket full of cherries. He wouldn't let me leave without giving me his telephone number, so cute! I pass by this house several times a week and never noticed the tree, because it was never so ripe with fruit. Massimo and I are now friends for life! Happy clients! See the sheep in the background? Another sensational day on the road. I will never tire of this!